Two cats make their home at the Good Samaritan Care Center. For years, during Town and Country Days, youth from the community have brought their favorite pets to the lawn in front of the Good Samaritan Care Center for the annual pet show. All the kids go home with ribbons that morning, and the residents get to see two of their favorite things: kids and animals. One of Muffy's favorite places to sit is in Fred Leuer's lap in the main floor lobby. Now the Good Samaritan has full-time pets of its own. Two identical gray cats - Fluffy and Muffy - were brought to the care center in August, first on a two-month trial basis and now to stay for good. The sibling cats were donated by an employee, Belinda Bierman, and have added an aspect of home to the Good Samaritan, said Kathleen Block, a certified activity director. The Good Samaritan Care Center - which stresses Christian spiritualness - has had an aquarium for years, but the cats are a step up in its pet program. The aquarium primarily offers visual interaction with the fish, but the cats offer visual and physical interaction. "They're just so loving and want you to pet them and pet them until they go to sleep," said Ida Reber, a Good Samaritan resident who is quite fond of the two cats. Fish can't purr, noted Block. Nor can they rub themselves against your leg, looking for attention, or jump on your lap, looking to be petted. "For people that have had pets all their lives or were around animals having that physical contact is important," Block explained. Fluffy and Muffy - who can be identified by the blue yarn on Fluffy's collar - have adapted well. Part of the trial period was aimed to see how the cats would respond to their new home. "If they don't have the right personality, then it's going to be a struggle and hard on the animals," said Block. "I've always loved pets," said Eileen Eischens, who has lived at the Good Samaritan Care Center for five months. Without the cats, Eischens said her life would be "not very good. Lonely," she explained. "Very lonely." "I never thought I'd see cats that I'd like so well again," added Reber, whose love for animals started as a girl, when she would go on home visits with her minister father and play with the family pets while her father visited with the family. "Everybody took to them, and they took to everybody, too," Reber added. The other part was to look at the logistics of having pets in the center. The staff had to be willing to pick up the extra duties that the cats require, such as, extra vacuuming, putting the cats to bed in the activity room each night, and training them that the kitchen is off limits with spray water bottles. Eileen Eischens pets Muffy, who has made himself at home on her bed. He visits Eileen daily. Residents who do not care for cats or have allergies can shut the door to their room to keep them out or can call the staff for help in corraling the cats. Fluffy and Muffy, though, spend most of their time in places they are welcome. "They know who likes them and who doesn't," said Block. The cats sometimes hide under beds when it's bedtime because they'd rather stay where they are instead of being put into the activity room for the night. "That's how much they love the people they're with," said Block. The cats have learned their way around the building. They can even switch floors when they want, waiting for the elevator or using the stairs, where they also have to wait for someone to open the door. "Here, kitty, kitty," calls Fred Leuer in the main floor lobby at the Good Samaritan Care Center. 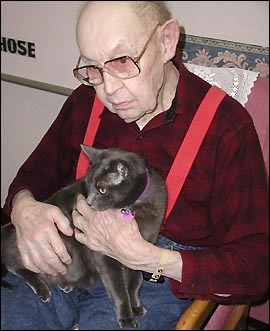 Leuer grew up with cats on the farm and likes to sit in the lobby with a cat on his lap. The cats are pretty nice and make his days brighter, he said. Pets are a valuable source of companionship for the residents, said Block, since animals are nonthreatening and nonjudgmental. "You only have to touch one person's heart at a time," she added. The addition of pets to a nursing home is a growing trend in the field. 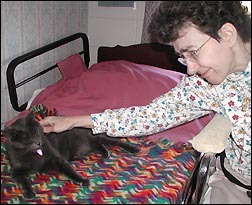 The Koronis Manor added a cat and a parakeet in the summer of 2000. "They're still doing fine and we still love them very much," said Lynn Lange, of the Koronis Manor. A decade or so ago, the Good Samaritan Care Center tried a pet dog, but that attempt was not successful, said Block, who has worked at the center for 25 years, including 23 years in activities. Any time you can make the residents feel better by improving their environment, instead of through medication, you should, said Block. The addition of pets and the emphasis on plants are a growing trend in the field: both aimed at making nursing homes more like the homes people are used to, said Block. "It's a nursing home image that's changing from a medical model to a holistic, home-like model," she explained. "It's not a sterile environment any more." The physical contact that the cats provide would not have been allowed under the strict cleanliness requirements of the past. Similarly, they add sounds. Instead of the dead silence of the past, nursing homes should be full of chatter, laughter, and meows. "To me a sterile environment is a lonely environment," said Block. Nursing homes have faced hard financial times in recent years, caused by a shortage of patients and an excess of beds. A proposed merger between the Good Samaritan Care Center and the Paynesville Area Health Care System, which operates the Koronis Manor, is expected to take effect in February. If the merger takes place, PAHCS plans an in-depth study of the long-term care market and the future needs and wants of long-term care residents. Residents will opt for the most home-like atmosphere, said Block. "You're competing for that person coming in your door. They're choosing by what you have to offer."